A picture-perfect smile isn’t just for celebrities anymore. At California Happy Teeth Family Dentistry, Dr. Sumity Sharma and her team offer a wide array of cosmetic dentistry solutions to meet almost any need, budget, or lifestyle. The research is in, most people notice a person’s smile first, and those with more attractive smiles have a better chance to be hired or receive promotions. Your smile may have a profound impact on every daily interaction, and we want that impact to be a positive one. 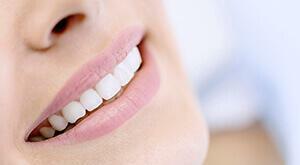 Contact our Milpitas, CA dental office to find out more or schedule your cosmetic dentistry consultation today. Porcelain veneers allow our team to transform damaged or cosmetically flawed smiles with just one, minimally invasive treatment. The process is completed over the course of two visits to our office, and it can be a good option for patients who wish to conceal chips, cracks, stains, and gaps. We start by removing a very small amount of surface enamel. Then we capture impressions that will be used by our lab to create the veneers, and we’ll give you a temporary set during that time. Once we receive your final veneers, you’ll return to exchange the temporary set for your custom crafted ones that will be fitted onto the front surfaces of your teeth. Lumineers are a unique brand of porcelain veneers. 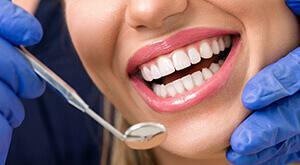 They are able to restore flawless smiles for patients with many of the same concerns including chips and stains. They are also created and placed at two separate appointments and are affixed to the front surfaces of teeth. What makes Lumineers so different from traditional porcelain veneers is their unique, ultra thin material. This allows us to place them without removing any healthy tooth structure, so you won’t have to wear a temporary set. We’ll simply capture a bite impression that will be used by the lab to craft your Lumineers. Then, you’ll return to our office to have your Lumineers placed once we receive them. Dental crowns and bridges are typically considered restorative treatments, but we also take the cosmetic impact of these large restorations into consideration. That’s why we offer metal-free, all-ceramic crowns. These can be used to restore damaged or decayed teeth to their complete, natural look and feel. We can also use dental crowns for purely cosmetic purposes to improve the appearance of flawed teeth when more conservative solutions are ineffective. 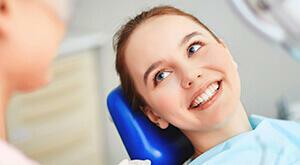 The design, creation, and placement of metal-free crowns can be completed in two visits. Similar to porcelain veneers and Lumineers, direct bonding is a great option for patients who want to conceal the appearance of chips, wear, stains, and gaps between teeth. Direct bonding uses the same material we use for tooth-colored fillings. Composite resin is a natural looking and feeling restorative material that can be applied directly to teeth. The putty-like resin can be shaped to conceal any cosmetic flaws. Then, we use a curing light to harden the composite resin into place. If you’ve tried every whitening toothpaste, mouthwash, strip, gel, and light available in your local pharmacy and you’re still not getting the results you want, it’s time for a visit to California Happy Smiles. Dr. Sharma uses the Renue line of professional whitening products, and based on your specific needs and teeth whitening goals, we offer both in-office and take-home whitening solutions. In-office whitening takes about an hour and can deliver results up to ten shades brighter. However, if you have sensitive teeth or want to see a more gradual change in the shade of your smile, this may not be the best option for you. Our professional take-home teeth whitening kits are much more effective and predictable than those products available at your local store. We combine a dose of whitening gel that is geared toward your unique smile goals with a custom crafted application tray that will keep the gel in place and active. 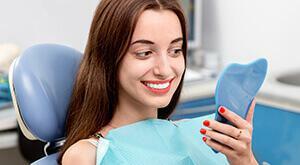 Patients will see the results they’re looking for after about two weeks of daily use.